It hasn’t drawn the attention of the new Morph Cut, or the new Lumetri Looks, but the recent addition of project consolidation and transcoding to Premiere Pro CC is a big deal. This is because it simplifies our ability to archive projects, or allows us to optimize existing projects for better playback. Transcoding allows us to take all the different video formats that we expect to use, or are currently using in a project, and convert them all to the same format. This can speed playback, decrease export times and assure that all our clips meet the same technical specs. 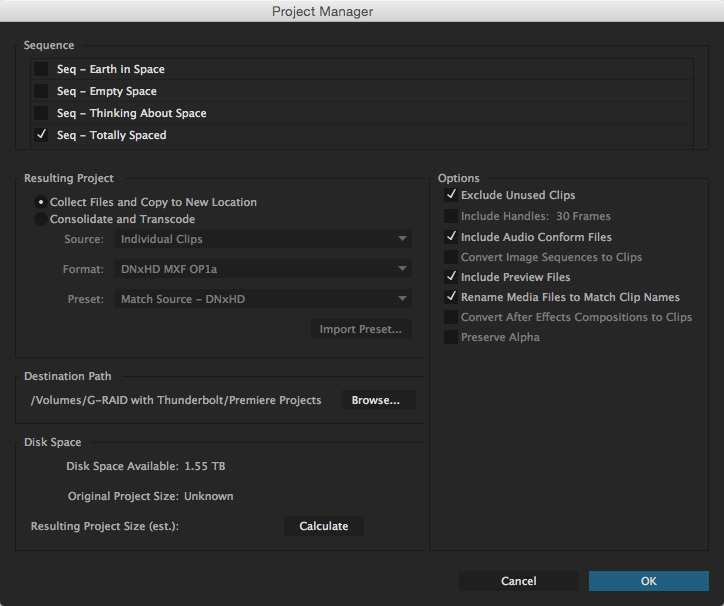 With my project file open in Premiere Pro CC, choose File > Project Manager. This opens the Project Manager window. Collect Files and Copy to New Location. This gathers all the files in the selected sequences and copies, not moves, them to a single new location. This is the best option when a project is complete and you are prepping it for archiving. Consolidate and Transcode. This gathers all the files in the selected sequences and transcodes them into a single format then gathers all those transcoded files into a single new location. This is the best option at the start of a project when you want to standardize all files into the same format. In both cases, sources files are not altered or moved. Exclude Unused Clips. 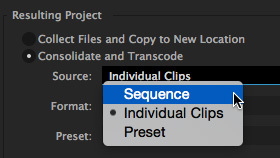 When checked, only clips stored in the select sequence(s) will be copied to the consolidated folder. This is the best option when you want to preserve a finished project. Unchecking this option copies all media in the Project panel, but does NOT copy any unchecked sequences. This is the best option for archiving a work in progress where final clip selection has not been determined. Include Audio Conform files. Ensures that the audio you conformed in the original project remains conformed in the new project. Unchecking this save disk space, but means you’ll need to re-conform the files if you reopen the archived project. Include preview files. Render files from the original project copied to the new project. Saving them means you don’t need to render again; not saving them requires less disk space. 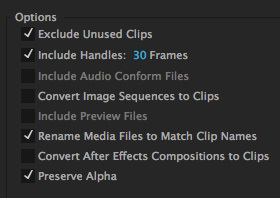 Rename Media Files to Match Clip Names. This renames copied versions of the source files to match what you renamed them to in Premiere. This means that the file names on your hard disk match the names you used in Premiere. But it also means that they no longer match the camera source files you used for editing. Renaming is an organizational issue. It has zero effect on image quality. NOTE: Consolidating copies entire clips. Even if Exclude Unused Clips is selected, if a portion of a clip is used in the project, the archive will contain the entire source clip. Copying the entire clip prevents image degradation which might be caused by copying a portion of a clip. After setting the Options, click the Browse button to pick, or create, a new folder to store the archive in. 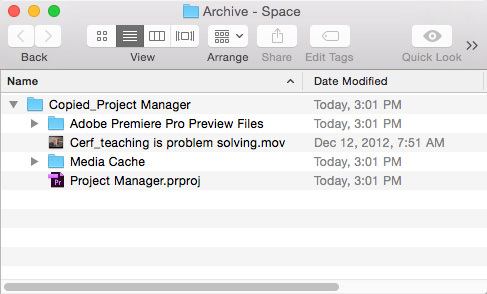 In this example, I’m using the Archive – Space folder. Archive folders can be named anything and stored anywhere; assuming you have enough storage space on that location. Click the OK button to create the archive. The archive was created in the selected folder, containing all used media files, a new Project file which is linked to the new media locations, plus all preview and cache files. NOTE: Project Manager does not collect and copy After Effects compositions that are dynamically linked to an Adobe Premiere Pro project. Project Manager does save the Dynamic Link clip in the trimmed project as an offline clip, however. Both Collect Files and Consolidate and Transcode gather your clips from wherever they are and store them in a new location of your choosing. However, the Transcode option allows you to easily convert the files into a “mezzanine” codec which is often a better choice for editing than the camera native file. NOTE: Transcode means to “convert.” You transcode clips to convert them into a different video or audio codec/format. When Transcode is selected, you can specify which format you want the clips converted into. Sequence is the best choice if your sequence settings exactly match your final deliverable. Individual clips is the best choice to convert a variety of clips into a common codec, without altering other clip settings in each clip. Preset is the best choice if you have a wide variety of clip formats and you want to convert them into a high-quality mezzanine format to preserve as much image quality and editing flexibility as possible. There is no one “right” choice that works for all, but my general preference is to use the Presets option. And shot the footage with a video camera, use ProRes 422 or GoPro Cineform YUV 10-bit. And shot the footage with a digital cinema camera, use GoPro Cineform RGB 12-bit with alpha. And shot the footage with a video camera, use GoPro Cineform YUV 10-bit. The GoPro Cineform codecs are excellent and are designed for transcoding. NOTE: Using the GoPro … at Maximum Bit Depth setting will create the largest files with potentially the highest image quality. However, unless you are using high-end cameras with professional film lenses, you probably won’t see a difference between the two Go-Pro settings. Exclude Unused Clips. Same as above in the Consolidate section. Include handles. This includes additional video before the In and after the Out which is useful for trimming and transitions. I would use a minimum of five seconds. Convert Image Sequences to Clips. This converts, say, a DPX series of still images into a clip. This can speed playback and editing. If you don’t have image sequences, don’t check this. Rename Media Files. Same as above in the Consolidate section. Convert After Effects Comps. 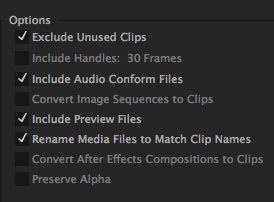 Because After Effects Comps can contain hundreds of layers, they can often choke Premiere. If you don’t plan to edit the comp, convert it to improve playback. Preserve alpha. This preserves transparency information contained in a clip. No camera, none, includes alpha channels as it is recording video. Alpha channels are only relevant for motion graphics or effects clips. If you aren’t using clips containing alpha channels, uncheck this to reduce storage file size. NOTE: The only preset that supports alpha channels is the GoPro CineForm With Alpha preset. All other presets flatten (remove) any alpha channel. As with Consolidation, select a storage location and click OK. NOTE: As with Consolidate, when transcoding, entire clips are transcoded, even if you are only using a portion of the clip in the selected sequence. The Project Manager is a powerful tool to gather all the different project elements into one place for final archiving. And the ability to quickly and easily transcode media into a single unified format from within Premiere is a huge benefit over having to use a separate utility for file conversion. For both these cases, Project Manager is worth learning about. The Premiere CC collect function definitely doesn’t work. It copies the media to a new location, if the files have the same name it generates a copy with an underline,for example, 00004.MTS, 00004_1.MTS, however, this new renamed copy does not match the file that should be, that is, 00004_1.MTS is equal to 00004.MTS. Any help?? I don’t have an immediate answer – I suggest you contact Adobe Support. If this feature really is broken, Support will notify the product team to get this fixed. But for the transcode function it seems like if the original setting is a Apple ProRes codec/Quicktime format, it can’t perform the transcode function. I saw that you noted that “When the source format cannot be matched, the clip is only copied and not transcoded” – do you know why this is or a way around this? You are correct. Transcoding is only necessary for video formats (codecs) that are not optimized for editing. ProRes, AVC-Intra, Cineform and others are already optimized so no transcoding is necessary. I would like a list of the locations of the raw files in my premiere project. Is there software for this? it seems like it ought to be a part of Project Manger, but doesn’t seem to be. After your clips are imported, go to the Project panel. Right-click any of the column headers – for example “Media Start” or “Media End” – and click Metadata Display. In the list that appears, twirl down “Premiere Pro Project Data”. Check the box for File Path, then click OK. Great!!! Been looking for that for a long time. Being very disorganized, this gets pretty close to what need. Is it possible to save the list to something like Excel, word, or just print it? I don’t know of any way to print it – other than screen grabs – or export it. But doesn’t mean it can’t be done. See what a Googles search tells you. Adobe is pretty flexible with its metadata. Hi Larry, thank you for the description! I am searching the internet to find a solution for a problem with the project manager that I have. It does not collect files just from the sequence that I select but it collects the whole project, which is huge. Do you know anything about an issue like that? Thank you very much! Is there any way to only export parts of the clips in the sequence? I don’t understand why they even give an option of handles since the entire video clip is transcoded and consolidated. I am prepping a sequence for color correction. 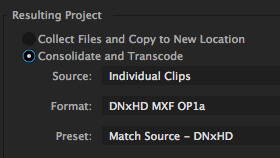 If you are prepping files for color grading, try exporting an XML file – no media involved and DaVinci Resolve can easily read it. I am prepping for telecine for resolve but need to transfer video via ftp for someone else is correcting. I too would only like to give 1 second of handles and not the whole take. Is that possible? Also, is there a way that it is taking the original shoot ftg (arri) and giving that as a source? Or is what the timeline is set to? The only way to limit handles is to copy all your media, which raises the possibility of artifacts and errors lost due to making a copy. As to using the source footage, this depends upon how you created your copies, whether file names and timecode match and where the files are stored. The answer is “potentially yes, depending…” Your colorist will have good advice on the best way to do this, as well as the best way to set the timeline. There’s no one process that works for everyone.